Trump’s Republicans Sell Us Out. Three Actions to Win Elections. Now that Trump’s Republicans have pushed through the disastrous tax bill, we need you more than ever to help us win elections–up and down the ballot–in 2018. Fischer, Sasse, Bacon, Smith and Fortenberry are all using family farms and family paid leave as political cover for giving a Christmas handout to Big Corporations and Wall Street. They are trying to distract us from the real pain that Nebraskans are going to feel under this new plan. Sign up to be a block captain. When you sign up to be a Block Captain you agree to canvass 50 houses in your neighborhood 3 times a year. 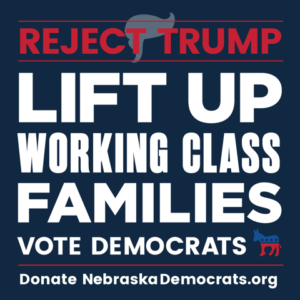 The first door knock is talking to your neighbors about voting by mail, the second time is talking about an issue facing Nebraska families, then finally a Get Out The Vote message for all Democrats on the ballot. This is a commitment of about 9 hours a year that will help elect Democrats up and down the ballot. Be a monthly donor. Our goal is to hit 200 donors in 2017 and we are at 191 right now, help get us over the finish line! Monthly donors support the vital work we do everyday to elect Democrats. Get involved locally. We have an amazing group of Democrats running for office next year that could use your support—in fact over 50 Democrats have announced so far. We have strong County Parties that need your help to keep growing and reaching Democrats at the local level. You can check out more ways to get involved on our website. Enjoy your holiday time with families and friends. Let’s get ready to knock doors and elect Democrats in 2018!